Economists and bank treasurers are almost certain that the six-member monetary policy committee (MPC) of the Reserve Bank of India (RBI) will cut the policy repo rate by at least a quarter percentage point in its April 4 review meeting. 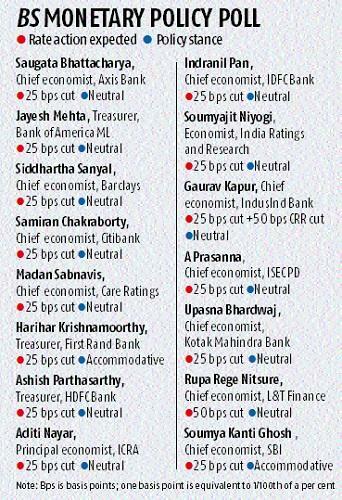 All the 15 participants in a Business Standard poll, comprising three top bank treasurers and 12 senior economists, said they expected at least a 25 basis points (bps) cut. Some even said they expect 50 bps cut, or even a cut in the cash reserve ratio as growth dives, even as heavy government borrowing meant liquidity conditions should be kept easy. Inflation is not a real concern now, the participants concluded, but falling growth certainly needs a careful watch. Gross domestic product (GDP) is expected to grow at about 7 per cent, or slightly lower, in the current fiscal year. Employment generation has also fallen, which makes growth a must consideration for the RBI. The Index of Industrial Production (IIP) grew at just 1.7 per cent in January, much lower than 7.5 per cent recorded a year ago. The consumer price-based index (CPI), the key gauge of inflation, meanwhile, was at 2.57 per cent, well below the RBI’s medium-term target of 4 per cent. Therefore, it makes sense for the central bank to frontload its rate cuts. An assurance by the central bank to continue with its open market operations (OMO), under which it buys bonds from the secondary market, is perhaps a must. Also, banks are really not passing on the past rate cuts, and therefore ensuring transmission of rates is also imperative. The tone of the policy would predictably be dovish, said the participants. “I expect the RBI to frontload the rate cuts and reduce the repo rate by 50 bps on April 4 to give a clear cut signal of policy easing. This is needed to kick-start transmission,” said Rupa Rege Nitsure, chief economist, L&T Finance. “A change in stance to accommodative combined with a 25 bps cut is also a possibility. Post elections, whichever government comes to power will adopt fiscal prudence in the initial years. 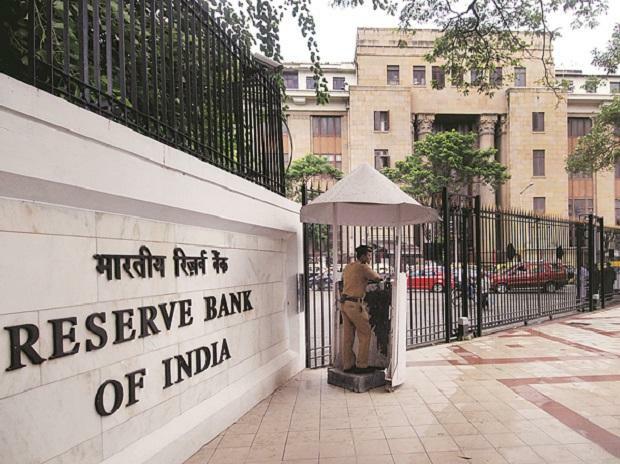 Uncertainties on account of El Nino, expiry of Iran crude oil waiver and elections, etc, would prompt the RBI to frontload the rate cuts in the first half of fiscal 2019-20,” Nitsure said, adding aggregate monetary demand, too, had slowed as reflected in M3 (broad money) to GDP (gross domestic product) ratio slipping below 80 per cent. She is not alone in her assessment of a sharp rate cut. According to Soumya Kanti Ghosh, chief economic advisor of the State Bank of India (SBI) group, a 50 bps rate cut is a possibility, but 25 bps is more likely. The stance would likely be changed to accommodative, he said. This is because of growth. “We are currently in a quasi-asynchronous growth cycle. While growth for India could remain muted for the next couple of quarters, the US could slip into slowdown mode in 2020. This warrants frontloaded policy support, though there has to be a delicate choice between exhausting the ammunition now, or may be to keep the powders dry for later use,” Ghosh said. Others also expressed similar views. “This is an unusual situation when inflation outlook is relatively clearer, but assessment over growth is full of quagmire. Thus a 25 bps cut and neutral stance along with better transmission through liquidity is a better outcome,” said Soumyajit Niyogi, associate director at India Ratings and Research. The economic conditions have really not changed that drastically on the ground, and therefore even if there is a rate cut, a change in stance may not be warranted, said Madan Sabnavis, chief economist of Care Ratings. Gaurav Kapur, chief economist of IndusInd Bank, said there was a case to cut the CRR by 50 bps, along with a rate cut, now that banks’ liquidity coverage ratio (LCR) was made 100 per cent. Meanwhile, the bond market is already factoring in at least two rate cuts. “The OIS (overnight index swaps) curve is pricing not only an April 4 rate cut, but another one in the coming months. However, bond yields have remained where they were in February when the last cut happened. Therefore, it is imperative that the RBI ensures liquidity conditions remain easy enough to create enough demand for the heavy supply of bonds in the next fiscal,” said Jayesh Mehta, country treasurer at Bank of America Merrill Lynch.